Khalid announced the dates of his first North American headlining tour which will kick off on June 20, 2019 in Phoenix, Arizona. 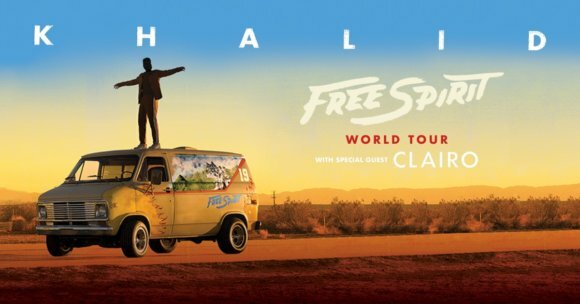 The upcoming tour is in support of Khalid’s sophomore album, Free Spirit, set to drop on April 5th. The “Khalid Free Spirit World Tour” will stop in cities including San Diego, Orlando, Toronto, Houston, Pittsburgh, and Atlanta before finishing up on August 17th at the AmericanAirlines Arena in Miami. Singer/songwriter Clairo will join the tour as special guest. Ticket sales for the general public open on April 5th at 12pm local time via LiveNation.com. Citi®/AAdvantage® cardmembers will have early access to a presale beginning on Tuesday, April 2nd at 10am local time through Thursday, April 4th at 10pm local time.